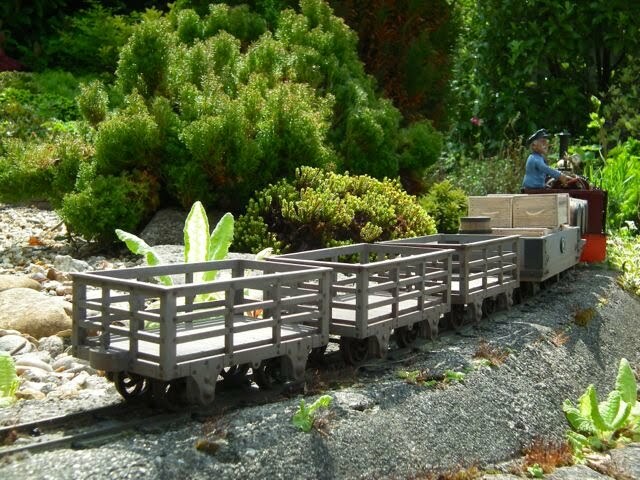 When Mike Ousby designed these kits he was very clear that he wanted to offer a simple, robust and low cost option for those who wanted a rake of wagons to go with the Accucraft Quarry Hunslet. The prototypes, from both the Penrhyn and Festiniog railways, were built of steel, but that was not a realistic option for these kits. Laser cut MDF did work though, and looked enough like steel from the normal viewing distance in the garden. With some hardwood reinforcing, it also passed Mike's robustness tests (dropping from the kitchen table and surviving being played with by 5 year olds!). And of course, they are designed to run on 45mm (2 ft in 7/8ths scale) track using the well proven Accucraft steel wheel sets. Now if I am honest, I was in two minds about these kits. I am on 32mm (18" gauge in 7/8ths scale), my rolling stock is always filmed close up and...well...I just wasn't sure about the MDF. But at the Peterborough Show, I decided to have a chat with Mike to see if I could buy them without the wheels. The answer was yes and as he only had the Festiniog version (the axleboxes are different), I bought three of those. You can see the result below, and I have to admit that I am delighted with them. I used Binnie Engineering 29mm diameter, curly spoke wheels and except for a couple of small modifications to the axle boxes and buffer, these are pretty much as intended. There was, however, something of a learning curve in the construction - with the odd wrong turn (as usual!). The kit looks like this - though most will buy it with the steel wheel sets included. The kits come with nice clear instructions and I also read Steph' Hicking's excellent build article in Garden Rail magazine before starting. But then I resorted to my tried and trusted modelling board to assemble the four sides at once. This was a bad idea - so after 20 minutes for the waterproof PVA to set enough to handle, I examined the result and took them apart with a scalpel! The second time I followed the instructions, though instead of set squares, I used steel blocks. The syringe is a great way to dispense the glue and a cocktail stick closes it nicely between jobs. When set, I just turned it over and glued on the other side. The next job is to glue on the inner sole bars and here the instructions advise one to test fit the brass axle bearings prior to gluing. Now as I was going to use non standard wheels and axles, I needed the bearings to slide in easily, and so would run a drill through after gluing. I just lined the holes up by eye and clamped them to set. Then came the floor, which is laser engraved to represent planks. On the first two I remembered to follow the instruction to notch the ends of the cuts, but in the one in this photo I forgot! A lat surface and a weight ensured that it sets absolutely square. The end reinforcing bars an then be glued on underneath at each end. The small brass bearings are normally from 1/4" stock, but mine varied in that some were 6mm OD and some were 6.3mm OD. This was not an issue as I just used a 6mm or a 1/4" drill to ream out the holes. After a little tidying of the bearings with a fine file, they would slide in nicely. With the Accucraft wheel sets, the bearings are flush to the inside of the sole bars, but I used Binnie wheels with 63mm axles which are significantly shorter. For these I had to push the bearings half way through the sole bars. This left me with a hole where the axle bearings should stand proud. I was going to make some extensions out of brass, but then found that I had a stock of steel studs that I had never identified a use for. As I am always one for the simple approach, I just sheared off the 'threaded' part with bolt croppers held in a vice, and then, after filling the hole in the axleboxes with rapid epoxy, I just glued the dome in place. The small engraved circle above the bearing is, I think, an oiling cap, so I drilled this and epoxied in a gimp pin (cut short). On the last wagon I used rivets of the same head size as I had run out. And needless to say, I did one side at a time! A word of caution here - be very careful when drilling into the MDF. It seems hard (and indeed it is) but get under the surface and it is soft and the drill will wander. The dumb buffers and couplings were simply glued together using the coupling pin as a locator. Here I deviated from the instructions by adding a steel face, epoxied on, and also a small fillet of wood to fill the gap between the buffer and the floor. I used rapid epoxy to glue the steel and the buffer in place. Then It was just a matter of adding the reinforcing lip to the top of the wagon. Now these are supplied as hardwood coffee stirrers and that makes them very strong. It is quite a good idea to have a few in stock, but beware that thickness and straightness can vary. The instructions suggest gluing and then turning the body over on to a flat surface to ensure they are true and flat, but I found they moved in the inversion process, so just used clips. I was worried that the slight angle of the laser cut would set the stirrers at an angle, but it was fine. So this is what it looked like when trimmed and sanded. You can see the dumb buffer here too. When I started these kits I had some reservations about the engraved rivets. Steph' Hicking used plasticard rods to extend hers and I did think of blobs of epoxy dropped on to each one. But life is too short....so I left them as is (well except for the one I broke off and I replaced that with a pin head). It was in the finishing of the first one that I made an error and learned a lot! You see I am used to plywood and real wood, where the natural thing to do is to sand it before finishing. It may be natural, but not with MDF. The surface of MDF is pretty smooth and the cuts, though not smooth, were very firm as the glue had clearly melted to give a plastic like layer. I used 600 grade Wet&Dry paper dry to gently sand everything and then as it felt a little 'furry' I primed it with slightly diluted PVA. When that was fully dry, I sanded it again and wiped it clean. I then gave it a couple of good coats of Halford's grey acrylic primer and flashed it off in front of the fan heater as usual. It was when I took it outside to photograph that I could see a problem - it had a seriously furry finish! It was only after three rubibngs down and re-coating that I finally got rid of the fur. I was perplexed - I mean what was this stuff made from? I checked my offcuts of 'normal' MDF to see if this was some sort of rogue batch but it was identical - and then the penny dropped - the clue is in the name: Medium Density FIBREBOARD. It is made from fibres! I decided that for the next two I would not touch it with abrasive at all. And Mike confirmed that one of the reasons he chose the material was that it didn't need sanding to get a smooth "steel' like finish. So for the next two, I resisted all temptation to sand - and they were fine. I did, however, sand the coffee stirrers before fitting and then just cleaned up the corners with emery. They took about five good coats of the primer and it is not easy to tell the difference. Oh yes - after the first couple of coats, I let it dry thoroughly and then filled the line where the front meets the side with fine filler. I simply smoothed this with a wet finger and then gave it the lightest touch with the emery when hard. You can see it here. After this - three more coats - or until you can't see the fibres. NOTE: One thought is to use a water based acrylic primer mixed with a little black to give the grey. I find the water based stuff tends to dry thicker and harder and might avoid the fur if you want to sand. Mike tells me that he uses this now with an airbrush. ANOTHER NOTE: James Gilchrist has just emailed me to say that Sanding Sealer works a treat on MDF. Of course! My version of weathering is more 'impressionist' than realistic, but it suits me and matches in with my other stock. It is also pretty quick (which I like!). 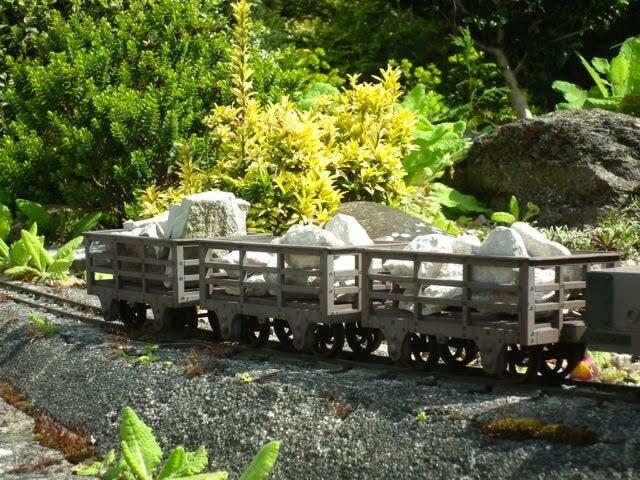 Here is wagon No 2 with the weathered Wagon No 1. First I brush paint the wheels with Revell acrylic 'Leather Brown' which I think is a better colour than their rust. Then I make a dilute wash of the same brown with just a little black. This is made up with half water to mix it and then some colourless bio-ethanol to speed drying. I then apply this with an airbrush, ensuring to get in at all angles. This is continued until it looks right to me - drying in front of the fan heater every now and then. With the light grey paint the contrast between the 'rivet' and the edge is a bit too great, so I drop a little of the wash on each one with a fine brush. I also brush paint some streaks and blobs to gently imply dirt and rust. Well as I said at the start, I had my reservations, but now I am a convert. I have thoroughly enjoyed making them and was even pretty relaxed as I repeatedly rubbed them down - before realising that it had not been necessary! I reckon, with hindsight, that the steel wheel sets (in 32mm) would have been a simpler and better bet, but am happy, as always, with the Binnie wheels. 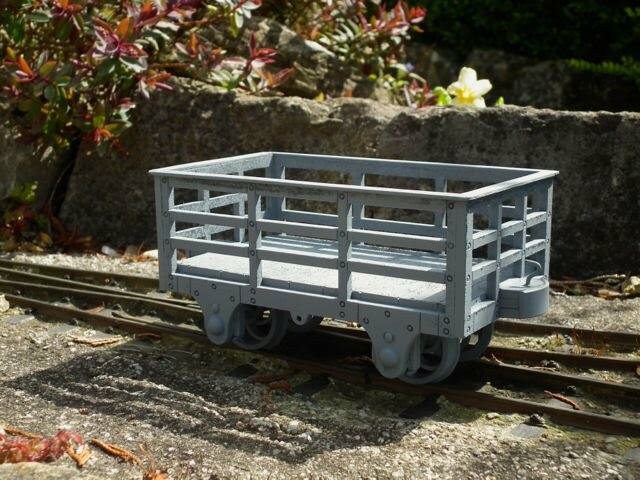 I don't think of them as Festiniog wagons - to me they are robust slate wagons on my railway and at £18 a pop, without wheels (£22 with wheels - and less if you buy a lot) they are great value.